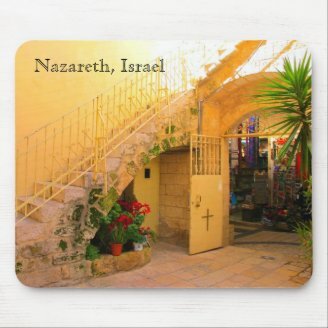 Historic Nazareth, Israel, is a magnet for believers and nonbelievers alike. Rich in religious history, one cannot help but be awed by standing in the same places in which Jesus, his contemporaries and many of his followers walked, prayed and studied. Give a gift that links one to that place and those times. 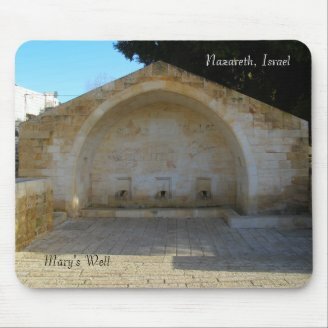 Recreated on mousepads, photos taken in Nazareth make the perfect gift. 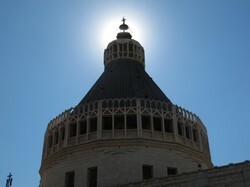 The dome of the Basilica of the Annunciation dominates the skyline. While the building, itself, is not an architectural wonder, it is a very significant religious site. According to the Catholic Church, this is where the archangel Gabriel announced to Mary that she would give birth to the Messiah. The dome is located exactly over the spot where her home is believed to have been. 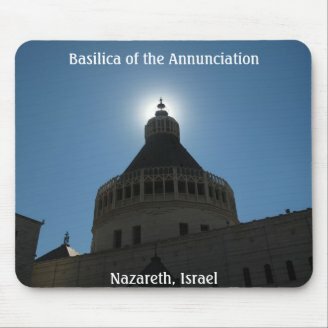 The photo on this mousepad was taken just as the sun set behind the dome, marvelously framing the peak of the dome in a circle of light. You can personalize the product easily by changing the text in the templates that open up when you view it. The stained glass windows seem to get lost in the massive wall around the huge inner hall of the Church. However, when viewed up close you see how spectacular they are, especially with the sun shining on them from outside. 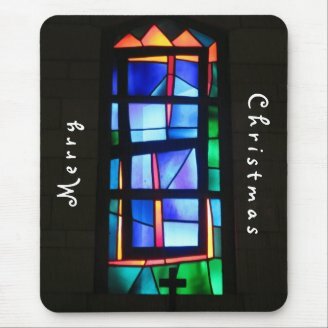 The mousepad features one of these windows. You can easily personalize the wording on the mousepad. When you open it, click on the button "customize" and you can change the wording and, if you want the font, size and orientation of the text. Perhaps you want to buy it for and Easter or birthday gift, or just for yourself. Everywhere you turn in the Old City of Nazareth, you come across history buildings, some of which are still in use and others not. The Sisters of Nazareth Convent it is a lovely example of a religious site that is still in use. The nuns run a school for the deaf and blind, a hotel for pilgrims and a community center for residents of the city. 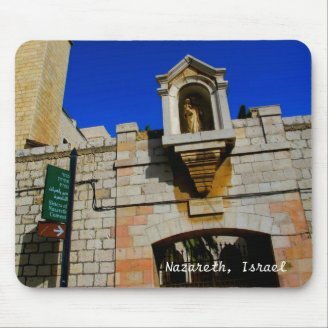 This mousepad shows a photograph of the entrance gateway to the convent, with the icon of the Mother Mary above the gate and the clear blue Israeli sky behind it. You can purchase this mousepad as is or you can customize it easily by changing the wording in the title or adding more text of your own. The Synagogue Church is where Jesus is purported to have studied and prayed when he was growing up. It has been proposed that this is also where he announced that he is the Messiah. The church is an island of calm for quiet contemplation and, perhaps, prayer. This photo shows essentially what there is to see in the Synagogue Church - it is one room with an altar. You can personalize it by adding any text in wording of your choice or changing the text that is written: simply click on "customize" and change the wording, font, size or location of the text. The small courtyard separates the bustle of the contemporary market of Nazareth from the quiet of the Synagogue Church. I sat for a few moments on the steps in order to delay returning to the noise and fuss of the market. This mousepad is easily personalized by changing the wording on the template that opens when you click on this product. You can also add more text - or take out the title that is there, if you prefer. Over the ancient well where Mary Mother of Jesus and other women watered their animals a modern construction was built commemorating the site. Beneath the well is a system of tunnels that were used in ancient times to supply water to homes in the vicinity. The water originated from the spring over which was build the Greek Orthodox Church of the Annunciation. The photo shows the modern building. 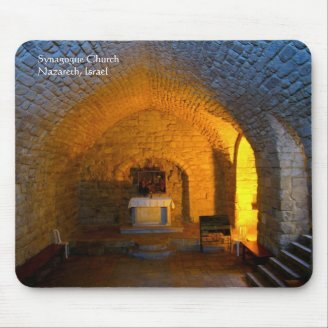 It is located on the main street of Nazareth in a large court close to the Greek Orthodox Church. Water no longer runs here. Which Mousepad Do You Like Best? What a great theme. I like the way your grouped them all together and great photos.